This is a modestly technical post. I was recently reading this article which made rounds in the econosphere, in which a couple of Lucasnipes criticize the New Keynesian class of macroeconomic models on the grounds that it was not yet fully microfounded, and therefore does not satisfy the standard of "policy invariance" called for under the Lucas Critique. 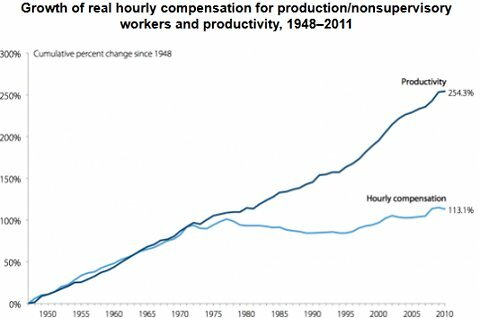 One of their critiques, in particular, was that the New Keynesian model does not explain the growing wedge between labor productivity and median wages since the 1970s, shown in Figure 1. That is an interesting point to call the New Keynesian models out on, because in fact no microfounded model I've seen, as yet, has been able to explain that wedge. In fact, almost all of the models proposed by the Lucasnipes fail to explain this phenomenon. Let me explain. where Y is output, K is capital, L is labor, and A is the famed total-factor-productivity. The parameter a, on the other hand takes a value between 0 and 1, and controls the relative proportions of K and L that the firm will optimally use. It is a fact about cobb-douglas production functions that in equilibrium, firms will pay a percentage of their revenues equal to a to the owners of its capital (which could be the stockholders) and a percentage 1-a of their revenues to the workers. Thus, 1-a is the labor's share of the aggregate income in this economy. However, the most often talked about point when it comes to household income inequality is that labor's share of the income is declining over time, and more of that income is going to the owners of capital. This is the effect that created the graph in figure 1. According to all those "microfounded models" using cobb-douglas production, that makes no sense. So there are two possibilities. One is that a is not actually a structural parameter, and has instead been growing over time for some reason. And there is nothing in the research that says it can't be growing as a response to some policy by the government, so in that regards all these microfounded models fail the Lucas Critique. The other possibility is that cobb-douglas production is a highly inaccurate way to model production, in which case, even if all those models satisfy the Lucas Critique internally, they never the less could fail to accurately predict the effects of policy changes because they don't actually describe the way the world works. Now, no one has yet proposed a more accurate model that we can use that avoids these problems and explains the productivity-income wedge. As a result, we should continue to base policy off of the most accurate models we currently know about, which is the New Keynesian theory.